Create a new game or press the 'Challenge' button against a game someone else has created who is waiting for an opponent. If you accept someone's challenge (or they yours), the game in on. You can also create a private game by pressing the 'Play With Friend' button. You will be given a unique link for the game which you can send (or tell in any way you choose) the person you wish to play against. When creating a game, you can choose the time limit you would like for the game. This is the total time allocated to each player to make moves. You can also choose 'Unlimited' if you would like to play with no time pressure. The game is turn based, unlike the regular SpeedCross. The player whose turn is up will have a red light on next to their name. For each turn you can either make a word(s), or swap one tile (drag it to the tile bag), or skip (by pressing the 'Skip' button). As soon as your turn starts, your clock will count down and will stop as soon as you end your turn. If you run out of time before the end of the game, you will have no more turns and your opponent can keep playing until their time is up or there are no more tiles. To place a tile on the board, simply drag it or click on a square on the board, then click the tile or enter the letter of the tile via the keyboard. All the tiles in each move must be in the same line horizontally or vertically. Also, you must use at least one existing letter on the board for the new word, unless it's the first word in which case it must use the middle square. To submit a word, click the "Submit" button or press the Enter key. Once accepted, a word cannot be undone. Only words in the dkm SpeedCross dictionary are accepted (over 170,000). No proper nouns. To recall all the tiles played in the current move, click the "Recall" button. You can swap a tile for a new one but that constitutes your turn (with a zero score). Drag a tile to the tile bag to swap it. The tiles run out and a player uses all the tiles on their rack. There are 98 tiles per game. Both players run out of the time limit selected when the game was created. One player resigns (presses the 'Resign' button). The other player automatically wins. There are four consecutive turns with a zero score (two each). Double Letter (DL) - letter on that square scores double its value. Triple Letter (TL) - letter on that square scores triple its value. 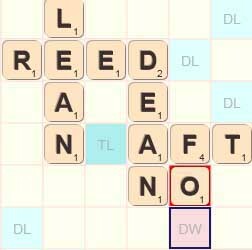 Double Word (DW) - word scores double. Triple Word (TW) - word scores triple. 7 tiles scores 50 points. In the example above, adding the letter "R" to the "O" already placed makes the word "FOR" and also makes the word "NO". Therefore, the score for "FOR" is 12 (double word), for "NO" is 2 which totals 14. A bonus of 6 is scored for forming two words giving a score of 20. You may find it quickest to place words using the keyboard. Click on a square on the board to highlight it and then enter the letter (of one of the tiles) to go in that square. You can move the highlighted square using your arrow keys. Press Enter to submit the word. Players will be given a rating as a measure of their skill, based on the Elo rating system used in Chess. All players start with a rating of 1000 and it will get adjusted	depending on the result of the game and the relative rating of your opponent. If you beat an opponent with a higher rating than you, your rating will go up more than if you beat someone with a lower rating. Guests can play but always have a rating of 1000, which is sub-optimal. Please register to get a proper rating.